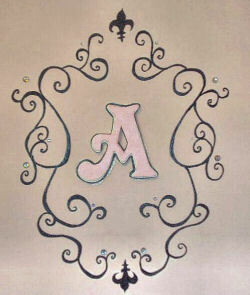 Our baby girl's elegant white, pink and black princess nursery. White, pink and back damask print baby bedding set for our little princess, Abigail Grace. The color scheme that we chose for Abigail Grace's white, black and pink nursery room design was determined by my daughter's baby bedding that I found for sale in an Ebay store that specializes in custom crib sets for a "less than custom price". The damask print collection that I chose was listed under the name "Sophia" and I just loved the way the soft pink fabric contrasted with the black and white damask print. We have lots more White, Black and Pink Nursery Ideas to share! My goal for the project was to capture the vintage feel of the space but in a modern way that was soft and feminine. My hand painted family tree wall art. Instructions follow. With it as my inspiration; I felt that I had the perfect foundation for this type of room. After I found the perfect crib set, I came up with my baby girl’s nursery theme, "Princess: Daughter of a Heavenly King". In keeping with the theme, I wanted to decorate with little white lambs all over her room. Her great-grandmother knit her a beautiful blanket with white lambs that had black faces and I knew that I wanted artwork for the walls to match this pattern but I couldn’t find ANYTHING! After exhausting all resources both off and online, I realized that I would have to DIY some cute lamb pictures to get what I wanted. 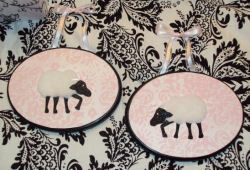 To make her lamb themed wall decorations, I bought wooden ovals at Michael's and painted the edges black. Next, I applied a pink on pink damask scrapbook paper as a background for the lambs. I used faux fur as the bodies of the lambs and glittered black paper for their legs. After adding a little diamond for their eyes, a pretty pink bow in their hair; they were done! See more baby girl nursery pictures featuring ideas for black and white in our photo gallery. I first found her From that I picked out the paint colors under the chair rail is "Olympic Camisole Pink" and above the chair rail is Olympic Pink Sunrise". I wanted to display a monogram above her baby bed, but I didn't want plain wooden letters for the baby's nursery wall or for the initials to be just a flat vinyl decal on the wall. After I checked the prices of custom vinyl wall decals in online stores, I knew that I would not be ordering vinyl! LOL! Still shopping for the wall decorations that I needed, I found a cute monogram for sale online that was printed on a fabric yard flag. I printed the image out and used it as a pattern to hand paint the combination of elegant scrollwork and fleur-de lis designs on the pink nursery wall using some of the black semi gloss paint that I had leftover from painting her crib. I found the cute wooden letter A at AC Moore for $1. I love scrapbook paper and I use it all the time to add color, a pattern, or texture to my crafts. Rather than just paint the wall letter and leave it at that, I found a shimmer-y pink paper at Michael's and traced, cut and glued it onto my wooden letter. Then I used mounting tape to adhere it in the center of the painted monogram frame. After everything was in position, I added little diamonds as an accent. I really loved how this turned out. My success with painting and creating my daughter’s custom monogram gave me the courage to attempt painting my own family tree wall decor. I looked at hundreds of pictures of family tree wall charts that were created using tree wall decals and stickers on Google images. Then I finally found one I fell in love with that, I believe, had been done at a California Zoo. First, I printed the picture that I found, traced it onto paper and then used an overhead projector to enlarge it to the best size for the nursery wall. I traced the tree pattern onto the wall and started filling it in with paint using the same black semi gloss paint that I used to paint the baby crib and the monogram. Just like the monogram, I used faux diamonds as an accent as well as little sliver frames that I cut out with my Cricut Machine. After the family tree painting was compete, I hung the little frames on the tree with pearl stick pins. Each of the frames will be filled with pictures of Abigail Grace’s great-grandparents and grandparents from both sides and of course pictures of her mommy and daddy. With the baby lamb decorations, the monogram and my do-it-yourself tree wall painting completed, I tried my hand at some woodworking in the next big project, a vintage wooden play stove. We found the basic woodworking plans for the toy stove at Knock OffWood, Ann White is AMAZING and she offers free woodworking plans so if you haven‘t already visited, you should. The plans were very easy to follow and since we had Lowes make most of the cuts at the store, all we had to do was bring the pieces home and nail them together! We bought the stove’s knobs from Hobby Lobby for $1 each and the wooden appliqués cost $1.49 for a packet of 2. I used white semi gloss paint to paint the stove that we had used to paint the house trim. So the total cost of the entire project was at $25! Not bad for a cute little stove! To see more of my white, pink and black decorating tips and planning that went into the creation of Abigail Grace’s princess suite nursery you can check out my blog @ Becoming Martha. You can go there to see more pictures of this room as well as the latest of my sewing and craft projects and tutorials when you leave Unique Baby Gear Ideas. Abigail's room is the sweetest and I will continue to visit this blog because I'm impressed with all of the beautiful designs. Simply want to say that Abigail's nursery is absolutely delightful. This is just a really cool room that has just the right amount of floral without being too overwhelming and flower-y, if you know what I mean. The black and white keeps the pink from just taking over and becoming a cliché. This is the sweetest nursery! This room is classy and sophisticated, yet it works for a nursery. very nice. I love this room, it's so sweet and perfect for a baby girl. I liked how they used toile print but I think my favorite part of the whole room would be the family tree wall art. This nursery idea is the best I have seen so far. It is beautiful! Job well done! This baby girl's room is so sweet and charming. This nursery is so very cute but classy. It is the perfect nursery for a little girl. I love that a lot of the decor is handmade and crafted and it inspires me to get out there and make more things myself. The DIY crafts that are displayed around the nursery are incredibly affordable yet still very chic and adorable!!! This will be a nursery that is easily transformed into a bedroom that her little girl will love using all that is in the room already. Definitely one of the best ones I have seen in a long time! What little girl wouldn't love this room? Love all the special, handmade touches you used in it. What a beautiful, creative room! You did an amazing job! Absolutely beautiful! :) Good luck...I think you deserve the WIN! It is such a gorgeous room for a little Princess! The black, pink, and white color scheme is perfect for a baby but transitions well even into the teen years. The handmade decorator extras are fabulous! I love this room. I'd like to modify it with yellow instead of pink. I love this room idea, so cute!! What a fun baby girl's room! I just love the combination of the pink and black. This is a room a little girl could grow in. you are awesome Jeni, i can't believe you handmade & handpainted so much of that!! Great job!! Beautiful room for any little girl! Just love the ideas!!!! This room is heaven sent. Love the colors together and makes me wanna be a little girl again. (If I could have a room like this). :) 5 stars for sure. Hope ya win the contest. It is adorable. The colors are awesome. Such a refreshing color theme. Abby's room is gorgeous & you did a great job! Abby deserves to win because she has the best room! so beautiful. you can see the love! You did an amazing job Dear! I just love it! Abigail is so lucky to have such a sweet mommy! She did a great job of making this room have a vintage feel yet look modern at the same time! Great job! I absolutely adore this room! If I had a baby girl now, this would definitely be my inspiration for her room! Wow! The amount of time and detail that went into this room, simply stunning! Classic girly that she won't grow out of! Love it. 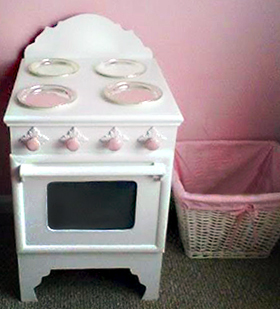 I love the colors, the damask, and especially the little stove! Instructions, details, and advice are easy to follow and the whole post, with photos, is very inspirational! This is such a beautiful room - love it! I love this!!! What a beautiful room! It is so pretty You did just an amazing job on it. 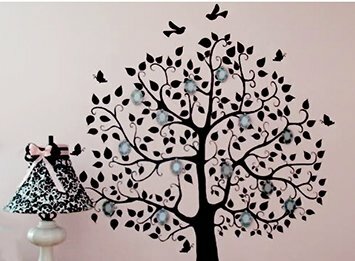 I love the pink and black and the wall tree is just too cool! Join in and write your own page! It's easy to do. How? 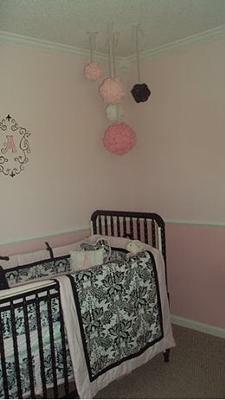 Simply click here to return to PINK and BLACK NURSERY PICTURES and IDEAS.